The Houthi group has accused the Yemeni official government of lying about its efforts to reach political solution, while evading the application of pacts to end the 4-year war. At the interview with Arabic Independent paper, Hadi Foreign Minister Khalid al-Yamani has but confirmed that "the Riyadh-aligned group of the resigned president [Hadi] continues to deceive citizen and international community," Houthi official claimed, noting that Stockholm Agreement "is first step in peace process." The Sana'a-based Saba news agency quoted the Houthi official as accusing the legitimate government of unwillingness to stop "Yemeni bloodshed" since peace "would end their funding and military provisions from coalition states." The war-end decision is not in the hands of Hadi government,but rather the "Saudi-Emirati aggression states backed by America and Britain," he added arguing that their insisting on the three terms of reference, the UNSC Resolution 2216 in particular, "is aimed only at prolonging the aggression." Warring parties in Yemen, after 8-day peace talks in Sweden, reached on the 13th of last December an agreement providing for ceasefire in Hodeida and redeployment of both sides' forces, exchanging prisoners and alleviating blockade imposed by Houthis on Taiz. 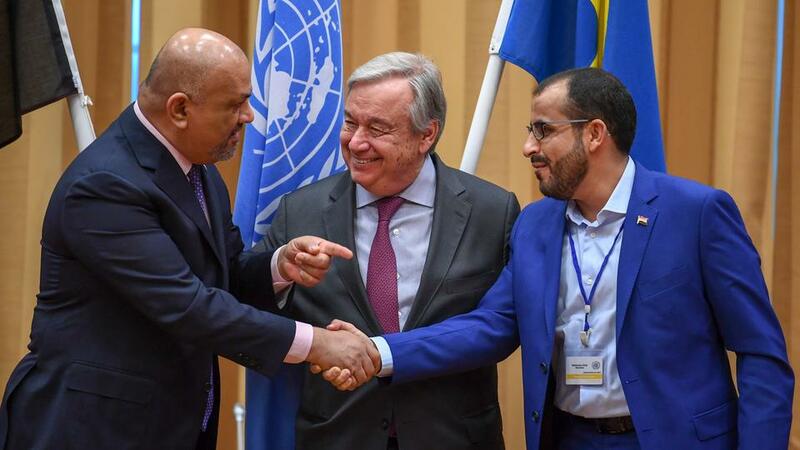 Minister Yamani has told the Arabic Independent that the Stockholm pact was a step of confidence-building towards the implementation of UNSC Resolution 2216, which provided for Houthis withdrawing from Hodeida and laying down arms. Hadi FM accused Houthi group of fabricating pretexts, hindering the UN monitoring mission, shelling the Red Sea Mills and preventing the distribution of food supplies stored therein, and rejecting to open humanitarian corridors. He claimed that Houthis had taken part in Sweden talks to help halt Hodeida battle, but they then "refused to apply the pact, as they had already achieved their aim." The conflict has lefttens of thousands killed, hundreds of thousands injured and 3 million displaced, triggering what the UN calls the world's worst humanitarian crisis,with most of the population in need for a type of humanitarian aid and immediate protection, including 14 million people risking famine and some 1.8 million children suffering malnutrition.